Growing up watching Michael Jordan and then Kobe Bryant, former CSUDH basketball player Zareh Zargaryan was inspired to write his own legendary story. While his two idols were crucial in helping propel American basketball to international status, as well as being two of the greatest players in NBA history, Zargaryan’s mark came with the Armenian national basketball team. In 2016, Zargaryan, who is of Armenian descent and grew up in Glendale, a city of approximately 200,000 people, some 35 percent of whom are estimated to be Armenian, was named the first-ever captain for the Armenian national team. As captain, he led the team to a victory in its first competitive international tournament, the 2016 Championship for Small Countries. “To be named the first ever captain in the country’s history was a huge honor for me,” Zargaryan said. Since it was its first international tournament, not much was expected of that Armenian team, but it won four of its five games, including beating two-time defending champion Andorra in the finals. And Zargaryan said it wouldn’t be possible had it not been for his career as a Toro. After spending two years at Citrus College, he transferred to CSUDH in the 2009-10 season. But he experienced a rude awakening. 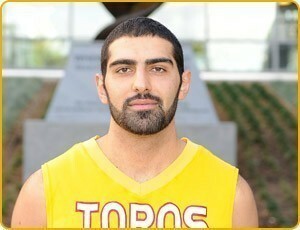 “At [CSUDH] for the first time in any level of basketball, [his junior year] I was benched,” Zargaryan said. “One time my coach didn’t even play me and after that game, I made sure that never happened again. So [CSUDH] taught me a lot of patience and determination to get where I am today. In his senior year, he was one of the team captains that helped CSUDH claim the conference championship, tournament, set the program’s record in wins with an overall record of 23-7, a conference record of 16-6, and its highest NCAA Division II ranking (fourth). Zargaryan statistically contributed the second-most points, assists and steals on the team, and third most rebounds. Unfortunately, Zargaryan said, the season came to an end earlier than expected when BYU-Hawaii avenged a season-opening loss to the Toros by beating them 83-76 in the NCAA Western Regional playoffs. As far as advice for current and future Toro athletes?